Are you having video or audio playback issues? There are various reasons for video or audio playback issues in PowerPoint. This article offers some suggestions for compatibility and troubleshooting. To avoid audio or video playback issues in PowerPoint, you can optimize media files you've inserted into your presentation for compatibility on other devices. For a list of supported file types, visit Video and audio file formats supported in PowerPoint. Tip: Some older video file formats may not work properly in Office on a Windows RT PC. If you're using that kind of PC, it's best to use newer media formats like H.264 and Advanced Audio Coding (AAC). Google recently made a change where it has retired the Flash Player infrastructure that PowerPoint 2010 depends upon for playing YouTube videos. PowerPoint 2013 and newer versions are based on the HTML5 video playback infrastructure (instead of Flash Player) and are thus unaffected for the most part. We are aware of the issue in PowerPoint 2010 and are investigating what we can do, but practically speaking, the most effective method of resolving this issue quickly is moving to a newer version of Office. You can also use PowerPoint Online, which is free and can be used with a Microsoft account (Hotmail, outlook.com, live.com). PowerPoint Online allows for the insertion and playing of YouTube videos. On the File tab of the Ribbon, select Info. If the media in your presentation was inserted in a format that might have compatibility issues when played on another device, the Optimize Compatibility option will appear. If it doesn’t appear, you don’t have compatibility issues and are ready to share. Select Optimize Compatibility*. PowerPoint will improve any media that requires optimization. * Embedded subtitles and alternate audio tracks are removed in this optimization process. If you have linked videos, Optimize for Compatibility reports that you need to embed them. Select View Links to proceed. The dialog box that opens allows you to embed the videos by selecting Break Link for each link you want to embed. If you have videos that were inserted using an earlier version of PowerPoint, such as PowerPoint PowerPoint 2007, you'll need to upgrade your media file format so that these files will play. Upgrading automatically updates and embeds the files in the newest format. Once you have upgraded, you should run Optimize for Compatibility again. To upgrade your media files from an earlier version (such as PowerPoint 2007) to PowerPoint 2010 or later (and embed linked files), on the File tab, select Info, and then select Convert. Having trouble inserting or playing media because of a codec problem? If you are having trouble inserting or playing media, it could be that you don't have the proper codec installed. For example, someone could send you a PowerPoint presentation with media based on a codec that your PC doesn't have. The best solution is for the author of the presentation to run Optimize Compatibility before sending the file to anyone else. Determine which codec you need to run the media. Read What is a codec and why do I need it? to find out how Windows Media Player can help you do that. Or install a third-party tool that can examine a media file and determine which codec it needs. Then install the codec required to run the media. You can find many codecs on the fourcc.org website. 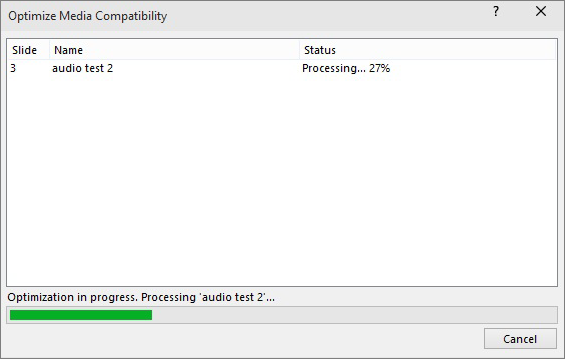 For a detailed discussion of codecs, see Encoding Audio and Video with Windows Media Codecs. Download a third-party media decoder and encoder filter, such as ffdshow or DivX, which will allow you to decode and encode a variety of formats. If you created a presentation on a PC and decide to deliver it on an Apple Macintosh, use media with the .mp4 file format extension. Having trouble synchronizing your music with your slide show? If your slide show is longer than one song, you can add more songs. However, if you find that you are having trouble synchronizing the music with the slide show, you can use a third-party audio editing tool, such as Audacity®to string the songs together into one file so they play continuously throughout the slide show. Contact us or ask the community for help with questions not answered here. If you're having trouble with audio or video in PowerPoint 2007, below are some things to check. Before trying these, you may want to verify that your media file is on the list of PowerPoint compatible file formats. Select the problem you're having for a list of problems and possible solutions. You inserted multiple sounds on top of each other, but only the top sound plays when you double-click it Drag the sounds off of each other, and then double-click each sound to play it. You cannot hear music or sounds that play in your presentation You need speakers and a sound card on your computer to play music and sounds. To find out what is installed on your computer and what settings are in use, check the multimedia and sounds settings in Control Panel. The sound file format is not supported in Microsoft Office PowerPoint 2007 Although your sound file may have the same file name extension as one in the compatible file formats list, it may not play correctly if the correct version of the codec is not installed, or if the file is not encoded in a format that is recognized by your version of Microsoft Windows. Encoding is the process of converting data into a stream of ones and zeros. Install the correct codec, or re-encode the file. Try playing the sound by using Microsoft Windows Media Player, which is part of Windows, to determine if the problem is with your sound file or with PowerPoint. You sent a presentation through e-mail, and the recipient says the sounds won't play Your sound files are linked and not embedded, and the sound files need to be sent along with your presentation. Copy the sound files into the folder that contains your presentation, and then use the Package for CD feature to update the links and bundle the associated files. You can find information about whether the sound is embedded or linked and the location of the linked sound file in the Sound Options dialog box. Click the sound, and then under Sound Tools, on the Options tab, in the Sound Options group, click the Dialog Box Launcher . Under Information, following File, you will see either Contained in presentation (meaning that the sound is embedded) or the file path (meaning that the sound is linked). You received a presentation through e-mail and the sound won't play See the article, I can't open a presentation or associated file sent to me by e-mail. You shared your presentation or copied it to a network file server, and now the sounds won't play Your sound files are linked and not embedded. Copy the sound files into the folder that contains your presentation, and then use the Package for CD feature to update the links, bundle the associated files, and copy your presentation and all the linked files to a folder on the network server. You copied your presentation to a CD, and now the sound won't play on a different computer You did not use the Package for CD feature, or you manually copied the sound files to the CD. Copy the sound files into the folder that contains your presentation, use the Package for CD feature to update the links to the sound files, and then copy your presentation again to a CD. You moved your sound files to a new location, and now your presentation won't play Copy the sound files into the folder that contains your presentation, and then either update the links by using the Package for CD feature, or manually update the links by removing the sounds and adding them back. The Package for CD feature will also copy your presentation and all the linked files to a folder. Note: If the path name of the linked file exceeds 128 characters, Office PowerPoint 2007 cannot find and play it. If the path name exceeds 128 characters, rename the file or shorten the path by copying the files into the same folder as your presentation. Then either update the links by using the Package for CD feature, or manually update the links by removing the sounds and adding them back. You want to open the Sound Options dialog box. Click the sound, and then under Sound Tools, on the Options tab, in the Sound Options group, click the Dialog Box Launcher . You sent your presentation through e-mail, and your recipient says the movies don't play. Movies files are always linked and are not part of your presentation. Copy the movie files into the same folder as the presentation. Then use the Package for CD feature to update the links and bundle the associated files. Or you can update the links manually. To do this, copy the movie files into the folder that contains the presentation, and then delete the movies and add them back. You shared your presentation or copied it to a network file server, and the movies don't play now. Movie files are always linked and are not part of your presentation. Move or copy the movie files to the same folder as the presentation or to the network file server. Then use the Package for CD feature to update the links and bundle the associated files. Or you can update the links manually. To do this, copy the movie files into the folder that contains the presentation, and then delete the movies and add them back. You copied your presentation to a CD, and now the movie doesn't play on a different computer. Copy the movie files to the same folder as the presentation. Then use the Package for CD feature to update the links to the movie files, and copy the presentation again to the CD. You moved your movie files to a new location, and now when you run your presentation, the movie doesn't play. Movies files are always linked and are not part of your presentation. Copy the movie files to the same folder as the presentation. Then use the Package for CD feature to update the links and bundle the associated files. Or you can update the links manually. To do this, copy the movie files into the folder that contains the presentation, and then delete the movies and add them back. You cannot find and play your movie file. If the path name of the linked movie file exceeds 128 characters, Microsoft Office PowerPoint 2007 cannot find and play it. Move or copy the movie file into the same folder as the presentation, and then delete the movie and add it back to update the link (path information). You inserted multiple movies or sounds, but only the top movie or sound is playing. Drag the movie icons or sound icons off each other and then try to play them. The movie file format is not supported in Office PowerPoint 2007. Try playing the movie outside of Office PowerPoint 2007 by using Microsoft Windows Media Player, which is part of Microsoft Windows. Start Windows Media Player and then use the File menu (you might have to maximize the window to see the File menu) to open and play your movie file in Windows Media Player. If the movie doesn't play, Windows Media Player gives you detailed error messages and a Help link that can help you troubleshoot the problem. In the Object type list, click Create from file, and then enter the name of the movie file or click Browse. Note: A movie that you play in Office PowerPoint 2007 by using Windows Media Player cannot have animation settings and special timings assigned to it. Instead, you play it by clicking buttons in Windows Media Player. If Office PowerPoint 2007 won't play your movie file either in Office PowerPoint 2007 or in Windows Media Player, try creating a hyperlink or action button on your slide and linking to a program that can play the movie file. Your movie file is listed as being compatible with PowerPoint, but your movie still doesn't play correctly. (See a list of PowerPoint compatible file formats.) Although your movie file may have the same file extension as one listed as being compatible, it may not play correctly if the correct version of the codec is not installed, or if the file has not been encoded in a format recognized by your version of Microsoft Windows. Encoding is the process of converting data into a stream of ones and zeros. Install the correct codec or re-encode the file. Your movie is captioned or subtitled. Office PowerPoint 2007 cannot play captioned or subtitled movies. To resolve the issue, try creating a hyperlink to the movie. Your movie plays as a white rectangle. The path name to the linked movie file exceeds 128 characters, and Office PowerPoint 2007 cannot find and play the movie. Move or copy the movie file into the same folder as the presentation, and then delete the movie and add it back to update the link (path information). Your movie plays as a black rectangle. This often indicates incompatible hardware acceleration. Try turning down your Hardware Acceleration setting, which is found in Control Panel. If you are using dual monitors (sometimes called multiple monitors), make sure both monitors are set to the same screen resolution in Control Panel, or try to set both monitors to a lower screen resolution. Note: If you do not see your problem listed above, you can search the PSS Knowledge Base or find answers from other users in the PowerPoint community.